The afore-mentioned prices are intended per day per person for a minimum stay of three days and include: full board, buffet breakfast, à la carte menu with side dish buffet at lunch and dinner,water , vine, beer and soft drink at lunch and dinner service and 10% VAT. RELAX rooms (dip. 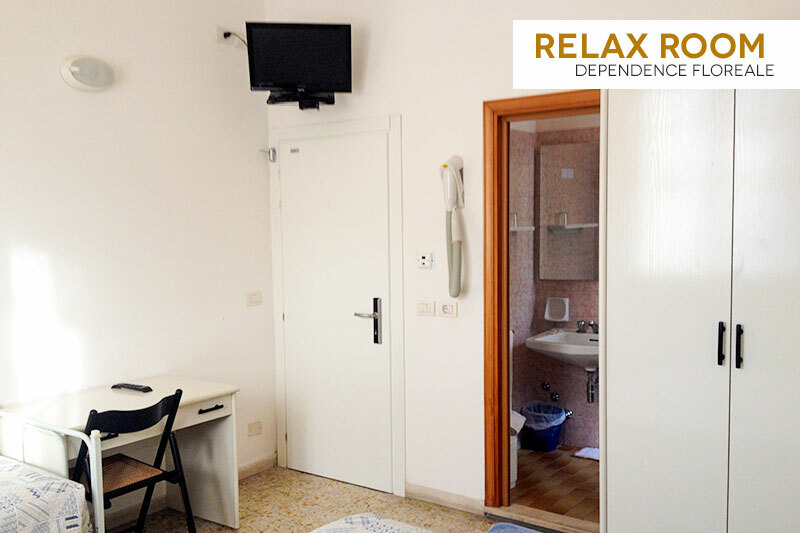 Floreale): come with TV set, independently operated telephone, hair dryer, safe, ceiling fans, own bathroom. Small balcony. 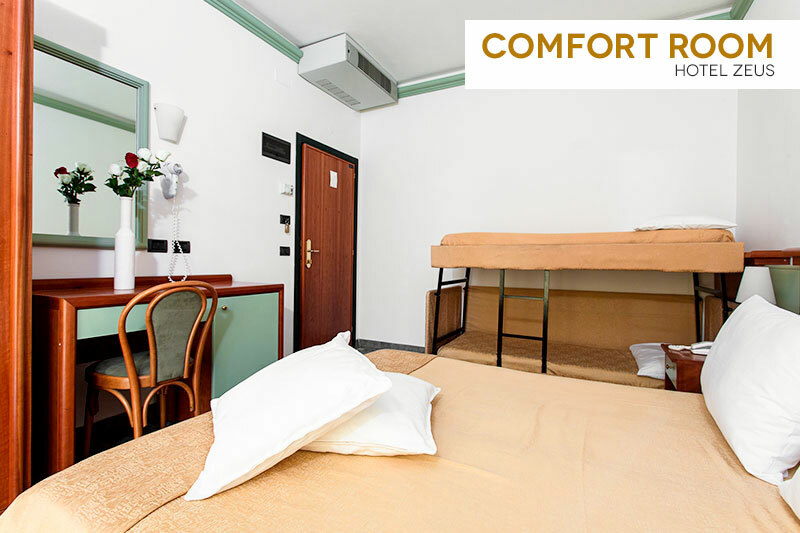 COMFORT rooms: at the Hotel Zeus they have air-conditioning/heating, independently operated telephone, Wi-Fi, bathroom with shower stall, mini-bar and color TV set. 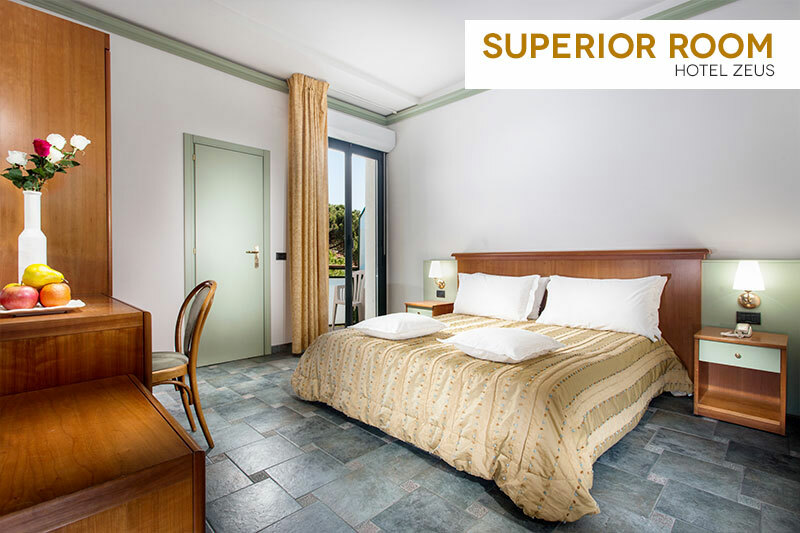 SUPERIOR rooms: at the Hotel Zeus they have air-conditioning/heating, independently operated telephone, Wi-Fi, bathroom with shower stall, mini-bar and color TV set, deck/balcony. - Departures earlier than the period reserved may be subject to a penalty of up to a maximum of 3 times the accommodation price. - For stays including full or half-board, any meals not consumed will not be reimbursed. Upon request, we will prepare a packed lunch as replacement. - Any meals (lunch or dinner) not consumed on the day of arrival cannot be carried over to the day of departure. - None of the offers can be combined with other promotions. No reductions are applied to children occupying a second bed in a double room. A 25% surcharge in addition to the accommodation fee will be applied for stays of 1 day, or 15% for a 2 day stay. RESERVATIONS: only reservations validated by the payment of a confirmation deposit to the sum of 30% of the total cost of the stay and a minimum of €200 per room, will be considered binding. CANCELLATION CONDITIONS: booking cancellations, late arrivals and early departures. In the event of a customer cancellation up to 30 days before arrival, a full refund of the deposit will be made. In the event of a cancellation up until the seventh day before arrival, the deposit may be used for a future stay. In the event the customer has paid for the full cost of the stay, then only the confirmation deposit of 30% will be withheld. On payment of the confirmation deposit, the standard booking conditions and, in particular, the cancellation conditions are deemed to be understood and legally accepted in full. Please be advised that, in accordance with the Legislative Decree 138/2011, cash payments can only be accepted up to a maximum amount of € 999.99.